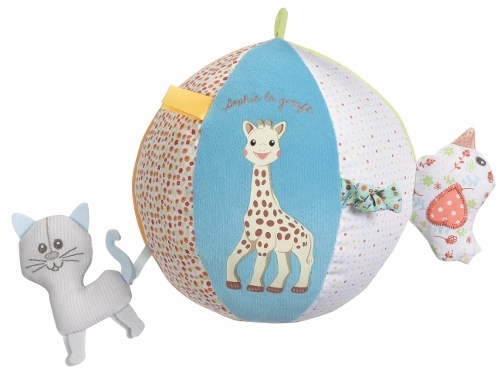 The Sophie the Giraffe Early Learning Ball is a large soft and cuddly ball, featuring Sophie the Giraffe and friends to keep baby amused and entertained in many different ways. Lazare the Cat peeks out from a secret hiding place where baby can find him and put him away again, he even squeaks too. Kiwi the Bird is hanging on her perch and crinkles when you play with her. The soft ball can be hung or simply rolled across the floor, encouraging baby to crawl after it. 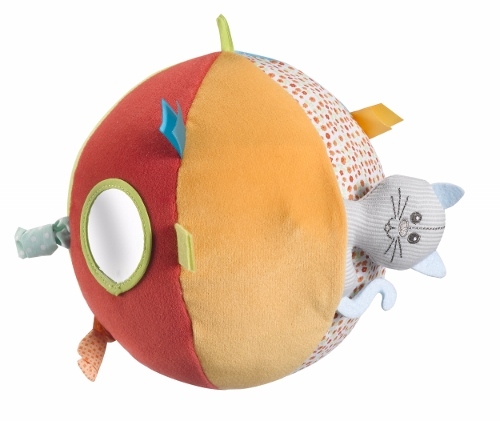 Great for encouraging manual dexterity, and soft enough to cuddle up to at sleep time, this activity ball will become a firm favourite for sure.